The Rubin Institute for Advanced Orthopedics offers multiple outstanding orthopedic and podiatric fellowship opportunities. Each program allows fellows to gain clinical and/or research skills while working with physicians who have earned a global reputation for their limb lengthening expertise, innovative techniques for joint preservation and replacement, and correction of complex foot and ankle deformities. Podiatric Residency Program: Each year residents come to train in limb lengthening and deformity correction at our teaching hospital. We offer a three-year specialized podiatric residency program in partnership with the VA Maryland Health Care System. For over a quarter of a century, the Baltimore Limb Deformity Course has trained thousands of doctors from all over the world in limb lengthening and bone deformity correction techniques through lectures and hands-on labs. We offer a few shadowing opportunities to observe clinic visits, physical examinations and surgical procedures with some of our physicians. International Center for Limb Lengthening Apps The International Center for Limb Lengthening has developed two innovative apps. 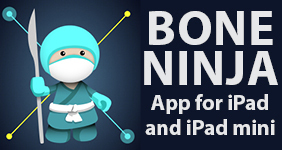 Bone Ninja is an iPad app teaching tool to help surgeons learn to analyze long bone deformities. The Multiplier App for mobile devices automates calculations to predict mature height and bone length in children.